The S7 edge has curves, the G6 has rounded corners - well, the S8 has both. The Infinity Display of the Galaxy S8 is a 5.8-inch dual-curved Super AMOLED panel of 2960x1440 pixel resolution in a 18.5:9 aspect ratio. And you thought the G6's proportions were weird. Out comes the microscope and under it we see a lot of tiny, differently-shaped subpixels in the typical Diamond Pixel arrangement. Blue and Red subpixels are half the number of green ones - theoretically their own resolution is 2,960x720 pixels, but through the magic (math, really) of subpixel rendering and the mere fact of having so many of them, the S8 can reproduce QHD resolution. We measured a maximum brightness of 440nits on the S8 when set to manual, practically identical to the S8+. Auto can boost that all the way up to 620nits, slightly lower than the big bro, but still plenty bright. Both phones outshine last year's models in manual and auto alike. We recorded a minimum brightness of 1.8nits, which is also excellent. Mind you, due to the nature of AMOLED panels, higher absolute values are possible (and have been achieved by other reviewers) if the area that needs to be lit is smaller. However, in the interest of fair comparisons, we've stuck to the usual APL (average picture level) we've used in the past. Sunlight legibility is where the S8 sets the benchmark - it's the new record holder in our outdoor visibility test, dethroning the Nokia 808 PureView (which we dropped from the comparison chart some time ago, as it's no longer relevant, strictly speaking). Admittedly, the S8+ nearly matches that, but 'nearly' is exactly the operative word. It's not exactly a run-of-the-mill display, the S8's, so a few more things to be said. Clearly, with an 18.5:9 ratio, the new format is better for watching movies and their trailers as they come in the even wider 21:9 format. Netflix is making a push in that direction as well. And even viewing older sources, living with letterboxing isn't really all that bad, since, at the end of the day you are still getting more usable space than on the Galaxy S7 edge. The only real difference being that bezels can't magically turn into extra screen real estate when needed, while the S8 and S8+ effectively offer an alternative that can. Speaking of streaming services and new content standards, HDR is quickly becoming the buzzword. We get it, if we are really going through with this wide aspect revolution, then we might as well get all the extra colors and contrast with that. The Galaxy S8 and S8+ support the HDR10 standard, but not Dolby Vision, which the LG G6 has. However, the HDR situation is currently a bit more complicated than that. 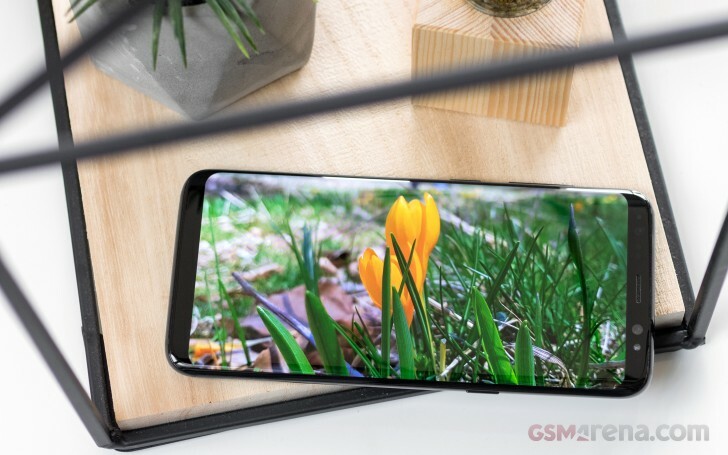 Samsung's new Infinity Display panel holds the UHD Alliance's "Mobile HDR Premium" certification - it is the first smartphone display to get it. It got there through a combination of 113% coverage of DCI-P3 and 142% of the sRGB color spaces, impressive levels of brightness and contrast ratios. DisplayMate recently gave the S8 panel its highest ever "A+" rating, so it should be perfectly well prepared for HDR, regardless of formal certification. Netflix seems to hold most promise, as a provider of next-gen content at the moment. However, neither the S8+ nor the G6 can currently get to HDR sources through the service. From what we can gather, Netflix currently offers HDR only as part of its UHD package. That requires a 4K or UHD device to view. Since the S8 and S8+ have a resolution of 2960 x 1440 or QHD+, they don't meet current criteria. Amazon has promised to adjust its system to accommodate the Galaxy S8 pair and the G6 soon, so they can benefit from the HDR part of the higher-res sources. AMOLED screens have become synonymous with saturated colors and the new Galaxy S8 and S8+ take things up another notch. Besides the already mentioned wide native color gamut, the screen also boasts significantly higher color saturation. Samsung is referring to it as a high-saturation 'Deep Red' OLED, which is a fancy term for even punchier colors. It is worth mentioning that our standard color tests all measure color accuracy against the sRGB color space. By that standard, our S8 unit managed an average deltaE of 2 and a maximum one of 3.2, using the AMOLED Basic mode - significantly better than the S8+ under the same conditions. The S8+ has a total of four selectable screen modes, each with its own gamut specifics. If you really want to get technical about it, AMOLED Cinema is very accurate as per the DCI-P3 color gamut. AMOLED Photo is what you want to come as close to Adobe RGB as possible and Basic Screen mode aims towards sRGB or Rec. 709. The latter is usually what consumer digital cameras, TVs, laptops and other tech aim for, so it could be a familiar sight, if you spend a lot of time in front of other screens. However, Adaptive display is what you probably want as your day-to-day setting. What it does is try to detect what kind of content is currently on-screen and adjust itself to that. It also makes good use of the entire extra wide color gamut range of the panel to offset some of the washout in brighter ambient light. This is great for outdoor use. The Galaxy S8 is powered by the absolute latest chipsets on the market and, be it Snapdragon or Exynos, that means the fastest modems on offer. Gigabit LTE (Cat.16 downlink) is the theoretical maximum on both and we're struggling to see where the 4-carrier aggregation of the S835 will be limiting, when compared to Exynos' 5-carrier one. Uplink is slower - Cat.13 on both chips for up to 150Mbps speeds. In some markets there will be a dual SIM model as well, but our review unit is the single SIM variety. Local connectivity is top-notch as well, naturally, starting with dual-band Wi-Fi a/b/g/n/ac. The Galaxy S8 is the first phone to support the latest Bluetooth 5 standard (don't call it '5.0'), with transfer speeds of up to 2Mbps (double the Bluetooth 4.x speed) and up to four times the range. 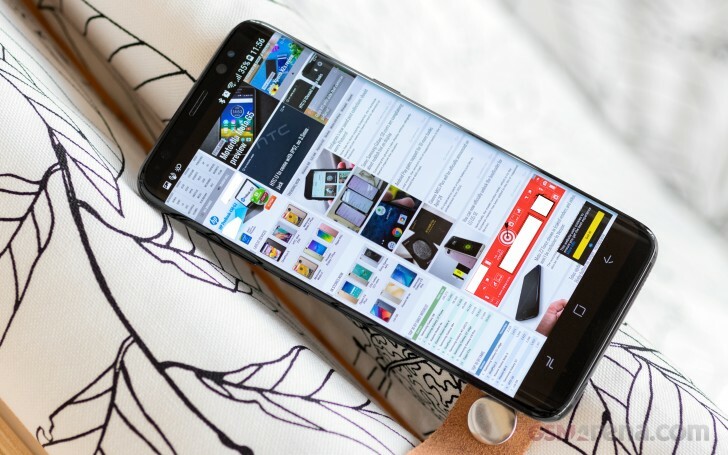 You can also connect two Bluetooth devices at the same time, though Samsung is quick to warn that the two may be out of perfect sync. For positioning you get pretty much everything - GPS, GLONASS, BDS, and Galileo. Being a Samsung phone, and having the Samsung Pay service, the Galaxy S8 supports MST (Magnetic Secure Transmission) - the phone's way of emulating a credit card magnetic strip. The payment service also makes use of NFC on newer cashier terminals, but you can use NFC even if Samsung Pay is unavailable where you are for other stuff like pairing peripherals. The Galaxy S8 is powered via a USB-C port. Samsung made the plunge with the Note7, and the S8 follows suit. Data transfers can go as fast as 10Gbit/s (it's USB 3.1 compliant), and with the two supplied adapters you're well covered for whatever scenario comes up. Let's say you want to plug in a full-size USB stick or a keyboard or a microUSB charger is the only one around, though we're not ones to carry a bunch of dongles 'just in case' (okay, maybe Victor is). The S8 can output video through that USB-C interface at up to 4K resolution at 60fps with the right HDMI adapter (Samsung sells one for $50), and if you want to go wireless, there's always Miracast and Google Cast. The wired connection can also be used in your car as long as the head unit supports MirrorLink. This standard mirrors the phone's screen (including touch input) onto the head unit. Samsung has implemented DisplayPort Alternate Mode on the Galaxy S8 and S8+, which is how the phones manage to drive a display with the DeX dock. And before you call us out on the fact that the latter has HDMI output, consider that DisplayPort is versatile enough to be backwards compatible with VGA, DVI and HDMI through the use of passive and active adapters, depending on the use case. Official information is not exactly abundant, but going by existing standards, this should mean the S8+ outputs video through DisplayPort 1.3. In theory, this should allow for video output at up to a whopping 4K@120Hz or even 5K@60Hz and 8k@30Hz. However, the official standard is one thing and real-world support quite another. In practice, you have the official option of using DeX for video out. It does retail for a hefty $150, but then again, the whole desktop experience does offer some added value. Samsung is trying its best not to advertise any of this too openly, but the DeX actually only outputs at a maximum of 4K@30Hz and that is only if you use it to mirror your device screen. The actual desktop UI gets rendered in 1080p@60Hz. 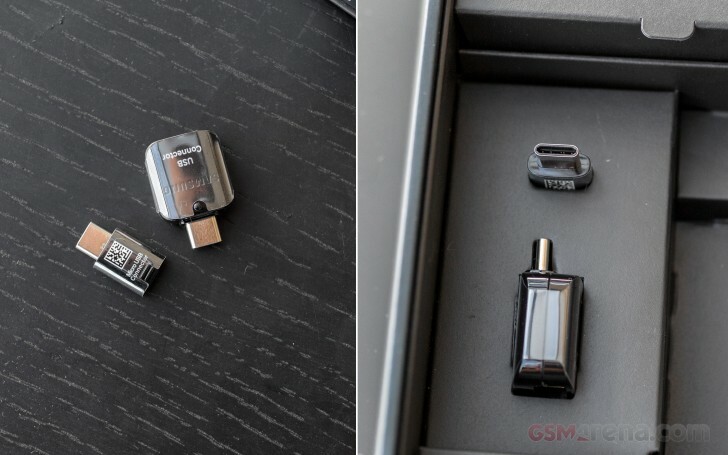 Rumors had the 3.5mm jack removed from the Galaxy S8 but in reality Samsung chose not to follow that (stupid) trend - a decision we can only admire. Or is just for this year, until AKG comes up with USB-C headphones? Hope not. Тhe Galaxy S8 is here to replace the S7, and in doing so it keeps the previous model's battery capacity at 3,000mAh. The S8 does have a larger display than the S7 (about 19% more area), but a newer 10nm chipset next to the S7's 14nm silicon, so things should mostly even out. Update (April 25): We received a second review unit and re-ran our battery tests. Good thing that we did. Not only was the standby power draw much more reasonable this time around, but the Galaxy S8's video playback time improved by two full hours, compared to the initially tested unit, reaching fourteen and a half hours - that's a negligible 20 minutes short of last year's model. We didn't observe any changes in the web browsing or 3G voice call longevity. Reloading web pages, the S8 outlasts the S7 by half an hour, and the voice call endurance of 24+ hours is also marginally better than the S7's. The Galaxy S8 thus scored an Endurance rating of 84 hours in our combined testing - four extra hours on top of the S7's result, and also four hours short of the S8+.